Ty Lawson, then playing for the Denver Nuggets, during a game against the Portland Trail Blazers in March at the Moda Center Arena in Portland, Oregon. No strangers to bold moves, the Houston Rockets appear to have executed another one over the weekend by acquiring guard Ty Lawson from the Denver Nuggets for a protected 2016 first-round draft pick and a handful of veterans with nonguaranteed contracts. It’s been a turbulent year for Lawson, who was recently arrested on suspicion of driving under the influence — his second DUI arrest since January. The guard will enter a 30-day alcohol treatment program by order of a Denver judge. 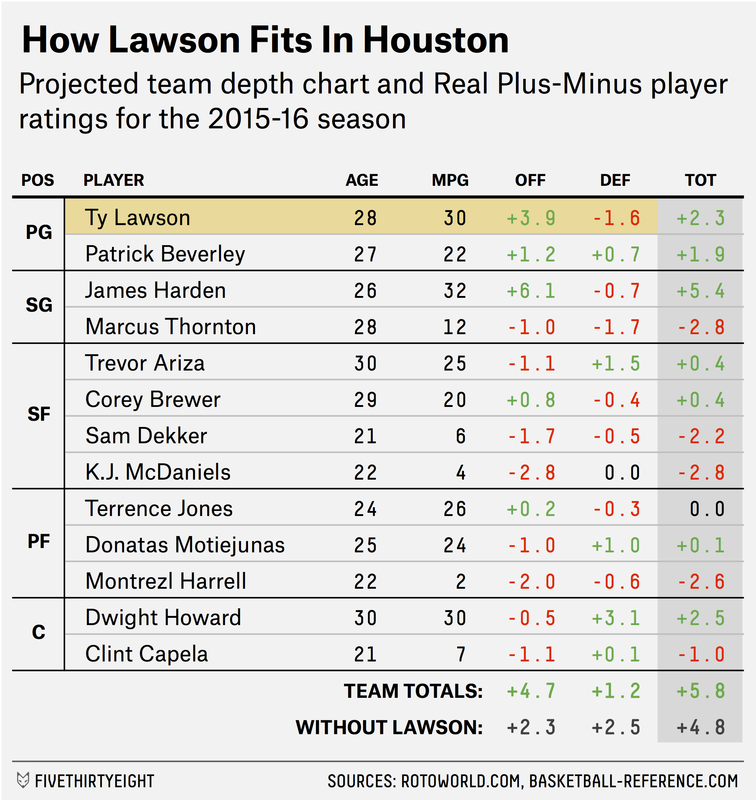 Despite his baggage, Lawson improves Houston’s roster. Two weeks ago, we ran preliminary preseason projections for the reloaded San Antonio Spurs and their top Western Conference foes using Real Plus-Minus (RPM) and Rotoworld’s depth charts; the Rockets graded out as a clear pick for fourth in the West behind the Spurs, Golden State Warriors and Oklahoma City Thunder. Rated the ninth-best offensive player in the NBA by projected 2015-16 RPM, Lawson is a major upgrade over backup Patrick Beverley. His presence figures to give Houston one of the best projected offenses in the West — perhaps even equal to the firepower of the mighty (when healthy) Thunder. Lawson does come with defensive limitations. His projected RPM at that end of the floor is nearly 2 points per 100 possessions below the NBA average. Because of this, our projections say he’ll add only between 2 and 2.5 wins to Houston’s bottom line despite more than doubling the Rockets’ offensive rating relative to the league average. Assuming he plays to form next season, though, Lawson will likely help Houston slide into the tier right below the powerhouse Spurs and Warriors in the Western Conference.